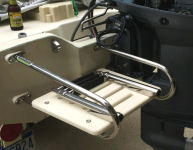 This platform is designed to fit Boston Whaler 150 Sport models made from 2003-2008. Built specifically for classic 18 Outrage hulls made from 1981-1990. Built specifically for classic 15 hulls made between 1976 - 1994. This swim platform is designed specifically for "16" foot Boston Whaler models made from 1961 to 1976. 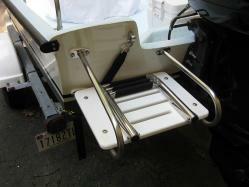 This swim platform is designed specifically for 17 foot Boston Whaler models made from 1976 to 2002.